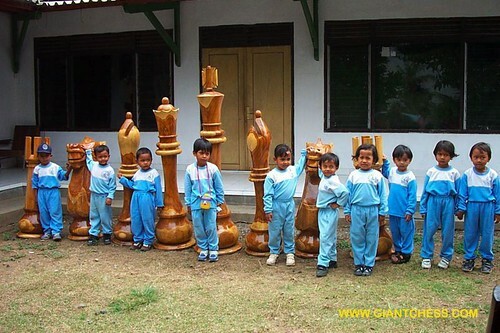 Those giant chess pieces are the real giant chess that has made from high quality of Teak wood. We have choose the best Teak wood for main material and has been through the process of dried. It is intended to anticipate the damage when used outdoors. Thus the choice of raw materials and process quality, you should not hesitate if you want to use it as outdoor decorations or outdoor games. Those giant chess pieces are sized 72 inch. Usually use for outdoor decoration at garden, backyard, hotel's garden, camp area, villa, public park, resort, and another interesting area. Add the unique view for outdoor area with its beautiful design. This handmade furniture has carved by expert craftsman and become funtastic chess pieces.